Visualize your paradise vacation in this beautiful beach home only a few steps away from the beach. Imagine enjoying your morning cup of coffee looking onto the ocean waves, hearing the seagulls and feeling the gulf breeze. In the afternoon, sway in the swing and allow the ocean waves to relax you or lull you to sleep. A FABULOUS VACATION HOME ONLY A 2 MIN WALK TO THE BEACH; SPACIOUS with 1414 sq feet; 3 bedroom and 3 FULL bathrooms which is ideal for your family and guests. This Galveston Vacation Rental has 5 star guest reviews dating back to 2008! The master bedroom has a king-size bed with a posterpedic luxurious mattress and an attached full bath and the second bedroom has a queen size bed and share a covered balcony with outdoor table and chairs. The third bedroom has a double and twin beds that the kids will surely enjoy! There are a total of 3 bedrooms and 3 full bathrooms! The upper balcony has relaxing views of the ocean. The kitchen has an excellent view of the ocean on one side and a bay view on the other. Enjoy preparing steaks and seafood on the grill in the patio area below. Bring your beach towels and head off to the beach. Available at the patio when you return is a swing and even an outdoor shower with hot and cold water to wash away the sand. If you prefer to not cook, a pleasant 2 minute walk will take you to the restaurant next door and even a well stocked grocery store. Enjoy a spacious and phenomenal beach home with a fantastic ocean view ''Docs' Quarters @ the Beach'' with leisure amenities and tasteful tropical decor! If you must work or check your email! You can get connected with internet access via secured WiFi. 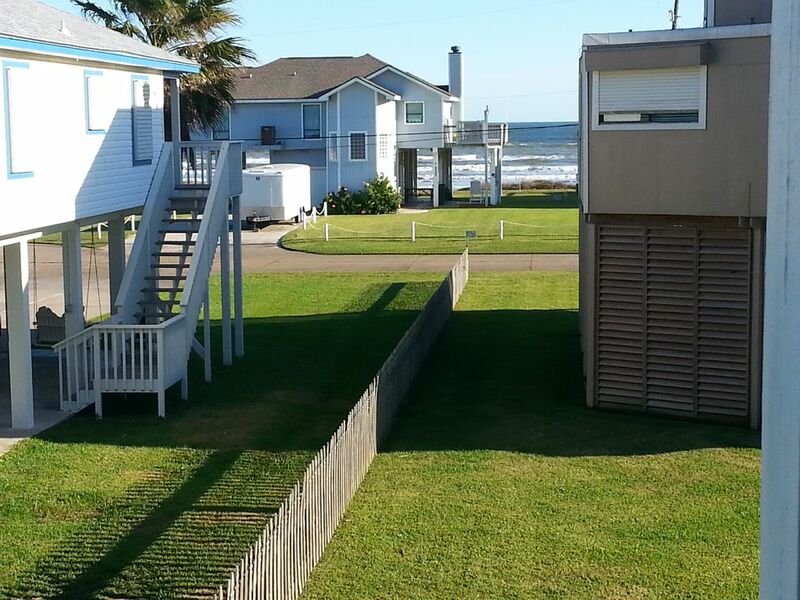 ''Absolutely the best little beach house in Galveston!!'' You will absolutely love this beach home and your vacation stay! Ask about our other listing; Docs Quarters @ Karankawa (vrbo site #973830); which is next door to this beach home!! Great location and the two are a perfect pair for extended family vacations! We have lived along the Texas Gulf Coast for over 25 years. We have seen Galveston grow into an exciting and beautiful resort city with a small home town culture! We enjoy walking along the beach especially early mornings and late evenings - watching the sun rise and the moon's radiant glow on the waves. We found the location great being that it is just a few steps from the beach!! The area is quiet and has a small town atmosphere. The grocery story next door is great for just purchasing ice cream or picking up steaks! Very private and close to the beach! A great, clean beach! approximatly a 2 minute walk to the beach, Hear the ocean waves from the balconies! Fantastic ocean view from 2 balconies! So relaxing! Great view of the Ocean from the balconies! Spacious living area with sofa bed; 2 reclining chairs and 2 assorted chairs, table for computer and a full bathroom at the living area. Automatic dishwasher available to keep you from washing dishes on your vacation! The upper balcony has a gorgeous view of the ocean waves and beach. A table with chairs are available at the upper and lower balcony to enjoy the sunrise and sunset. 2 balconies and 1 patio which total 3 for the home - The covered patio below can be used for outdoor entertaining or just lounging in the swing. We loved our stay at your house. Very clean and lovely place!! This is a comfy place with plenty of room - excellent beach access - fully-stocked grocery store within walking distance. We stayed with 4 adults for the Galveston Featherfest an annual birding event. Several birding areas are close by. Thank you Yolanda! Loved this beach house short walk to beach and grocery store is so close for anything you might need. Equipped with all the stuff you would need. Lots of beach toys for kids. Tastefully decorated. Thank you! It was our pleasure to be able to host your family for the Birthday celebrations! Thank you for the lovely review!! I greatly appreciated having you and your family stay at our home. I hope you are able to visit us again next Spring Break! Approximately 15 minutes to Schlitterbahn Water Park and Moody Gardens. Check our map for location proximity! We provide an accidental damage waiver for $35.00 that provides up to $300 of accidental damage to the interior of the beach condo, therefore, no damage deposit is required. Damage waiver does not apply for reckless use of the property.